So when Sebastian threatens to dissolve their years-long conspiracy, she’ll do anything to save their partnership...even if it means opening her vulnerable heart to the rake who could destroy it for good. I was really excited going into this one. And I did really enjoy it. 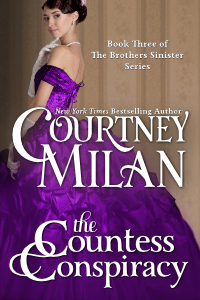 Courtney Milan is a great author. But I was a little let down. The ending especially is were I thought there could've been more development. Sebastian and Violet were both great. He was probably the best version of the "unrequited" love character I've ever read. So good, I even feel weird classifying him that way. And Violet was such a complex character. They also have a very interesting relationship. They are friends, but also have a really difficult situation to deal with. Sorry, my recent reviews have been pretty crappy. I'll try to get better.